New year. New decade. I like the idea of starting fresh. Moving on from the past and reinventing oneself. 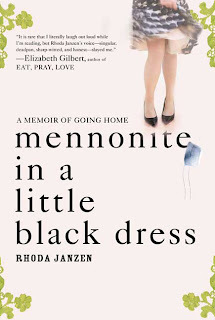 That's one of the many reasons that I greatly enjoyed Rhoda Janzen's memoir, Mennonite in a Little Black Dress. I learned about the book from Henry Holt & Company and was happy to accept a complimentary review copy from them. One thing that I've learned in my life and that was a big part of the book, was that as much as we may want to let go of the past to go forward, sometimes we have to take a look back first. Two mini steps backward to make a giant leap forward. Rhoda Janzen is currently an Associate Professor at Hope College. She loves poetry, creative writing, and American literature. She seems to have it all together. But when you read about how her husband left her for a man named Bob that he met on Gay.com, then you see all the complexities that she's had to deal with over the past several years. As tragic as that sounds, the book is hilariously funny. I laughed out loud for real. Not just a silently smiling lol. You know when you're sitting quietly on the train, and you hear someone start cracking up laughing? You look up and see someone smiling and hunched over a book. You try to see what they're reading, because you don't want to interrupt them by asking. I bet that some of them are reading this book. The same week that the author's husband left her, she was hit by a car and left with several broken bones. I know. Hilarious! So at age 43, she went back to her parents and the Mennonite community in California, where she had been raised. Before reading this book, I hadn't heard that much about Mennonite culture. I still know virtually nothing. But I did learn a little something about the food. Zwieback, also spelled zwiebach, is a standby at special events, celebrations, and funerals. The word means "twice baked" in German and it's a crispy sweetened bread. I had grand ambitions to make some for this post, but it didn't happen. Here's a recipe if you'd like to try it. The author, Rhoda Janzen, enjoys cooking and food is mentioned a great deal in the book. Finding out what people eat and how it impacts their lives always intrigues me. Click here for recipes for Old-fashioned Apple Pie-by-the-Yard, Split-pea Soup, and more information about the book from Henry Holt. One particulary funny and food-related part of the book is the list of the top five Shame-Based foods for Mennonite youth lunches. The reader might well inquire why a pacifist Mennonite family was singing songs about soldiers. Further, and perhaps this is more pressing, the reader might justly inquire why this soldier was making potato salad in his pants. I'll leave you with that vision in your heads dear readers! To read the rest, you'll have to get the book! *Updated 4/13/10* Now available in paperback too. *Updated 5/1/10* Recently, Borders Media did an interview with Rhoda Janzen. Take a look here. Thanks for this delightful review! I can't wait to read it. I love book suggestions. Great review. I'll be putting this one on my Amazon wish list. Thanks!!! That does sound like a good read! Thanks for sharing. :-) I mostly listen to audio books these days due to time issues, but I did get to read two books on our vacation. The first one, The Help, was awesome. The other one I'm still trying to decide on. t - Let me know what you think! the toll house cookie - Glad you enjoyed it! shirley - You're welcome! Audio books seem to be getting increasingly popular. I'll have to try it sometime.